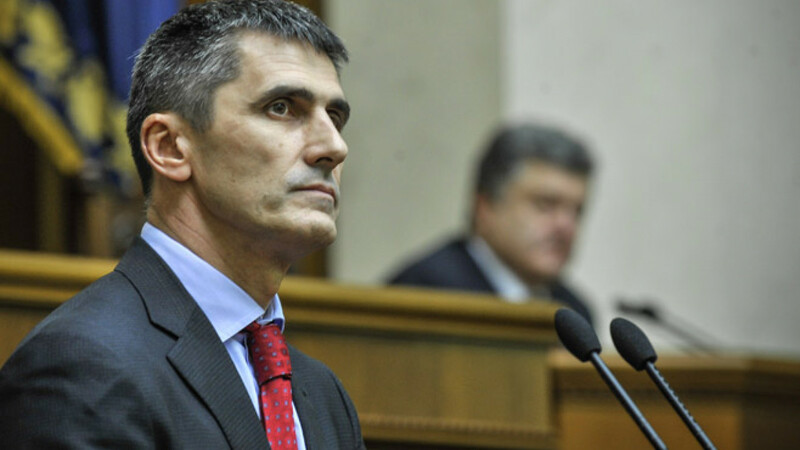 New Ukrainian prosecutor-general Vitaly Yarema speaking during a parliamentary session in Kiev on Thursday. Ukraine's parliament gave President Petro Poroshenko a strong boost on Thursday by resoundingly endorsing his candidates for three key posts in his new team who will have to tackle a pro-Russian uprising, a near-bankrupt economy and endemic graft. Poroshenko's nominations for foreign minister, Central Bank chief and prosecutor-general each won more than two-thirds of parliament's votes — an unusual level of support for the president as he takes the helm after the ousting of his Moscow-backed predecessor Viktor Yanukovych in February. Diplomat Pavlo Klimkin, 47, until now ambassador to Germany, was approved as foreign minister and will be at the forefront of moves to shift Ukraine into the European mainstream as well as dealing with a diplomatic standoff with Russia over Crimea and rebellions by pro-Russian separatists. A Moscow-educated physicist who joined the foreign service more than 20 years ago, Klimkin is committed to European integration and has played a key role in negotiating the association and free trade agreements with the European Union, which Ukraine is expected to sign later this month. Parliament also endorsed Valeria Hontareva, an investment banker with 18 years' experience in Ukrainian and international financial institutions, as new Central Bank chief. 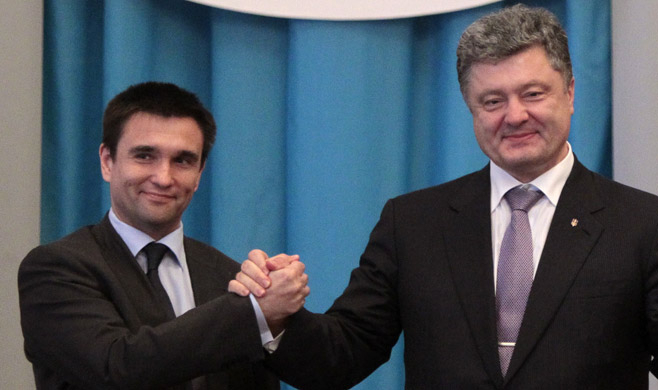 Pavlo Klimkin with Petro Poroshenko. Hontareva, who will figure prominently in negotiations with the International Monetary Fund and other major lenders, held the post of first deputy chairman of the board and financial markets chief at ING Bank Ukraine from 2001 to 2007. She has also served on the board of Societe General Ukraine, where she was responsible for capital market operations. In a brief comment to parliament after the vote, Hontareva said: "My appointment can be seen as a positive signal for bankers and a positive signal for international investors." First Deputy Prime Minister Vitaly Yarema also won strong endorsement for the post of prosecutor-general — a key law-enforcement position in the fight against rampant corruption in the former Soviet republic of 45 million people. "The fight against corruption is as important as that for peace," said Poroshenko as he recommended Yarema to the assembly. Poroshenko still has to announce his nominations for defense minister and the head of the SBU state security service — two other key posts, given the security crisis in the east and on Ukraine's border with Russia.